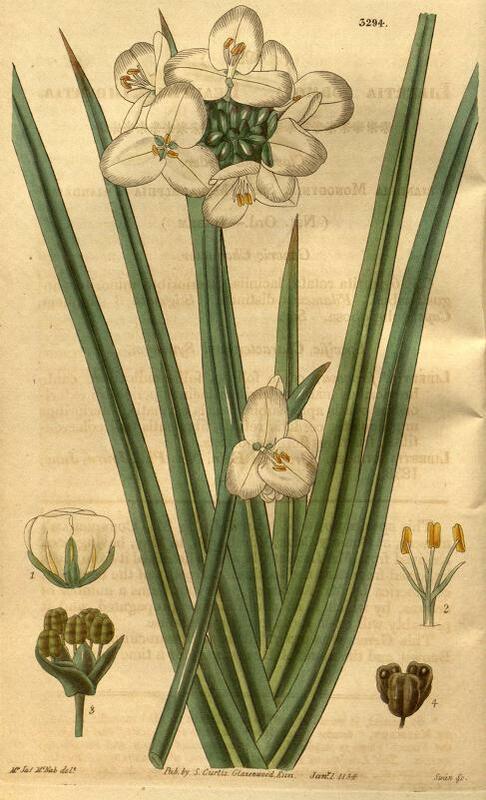 Libertia chilensis (Molina) Gunckel, Revista Chilena Hist. Nat 31: 87 (1927). * Strumaria chilensis Molina, Sag. Stor. Nat. Chili, ed. 2: 130 (1810). Choeradodia chilensis (Molina) Herb., Amaryllidaceae: 87 (1837). Libertia crassa Graham, Edinburgh New Philos. J. 14: 383 (1833). Libertia elegans Poepp., Fragm. Syn. Pl. : 1 (1833). Libertia formosa Graham, Edinburgh New Philos. J. 15: 383 (1833). Taumastos compressus Raf., Fl. Tellur. 4: 10 (1836). Sisyrinchium fernandezianum Steud., Nomencl. Bot., ed. 2, 2: 595 (1841), nom. nud. Libertia ixioides Gay, Fl. Chil. 6: 31 (1854), nom. illeg. Libertia grandiflora Phil., Bot. Zeitung (Berlin) 14: 648 (1856), nom. illeg. Sisyrinchium formosum (Graham) F.Muell., Fragm. 7: 91 (1870). Libertia formosa var. crassa (Graham) Baker, J. Linn. Soc., Bot. 15: 153 (1876). Orthrosanthus chilensis Klotzsch ex Baker, J. Linn. Soc., Bot. 16: 121 (1877), nom. nud. Tekel formosa (Graham) Kuntze, Revis. Gen. Pl. 2: 702 (1891). Libertia formosa var. grandiflora Johow, Estud. I. Juan Fernandez: 150 (1896).